This age is called the age of Kali Yuga, which means the age of lawlessness, confusion, misunderstanding, irresponsibility, anxiety and anguish, and so forth. Anyhow, there is no need to believe in the Hindus' view of Kali Yuga, because we have seen with our own eyes the universal lawlessness, confusion, misunderstanding, anxiety and anguish, high-jacking and low-jacking, misappropriation of others' property and homes. We have domestic lawlessness, disintegration of family life as well as social life, national life and international life, religious corruption and various types of misery, from physical to spiritual. We see the destruction of our planet Earth by various types of physical pollution, mental pollution, spiritual pollution, nuclear pollution and acid rain. We have ruined our soil, our waters, lakes and rivers and our food crops. In such a condition, we do not see any man or woman who is happy in any way. What to do in this predicament? Be sure, you cannot make peace, happiness or bliss. They have to be experienced. In fact, true peace, happiness, bliss, unity and peaceful coexistence are the way of nature. They have to be experienced within one's "I-Am" by going beyond the body and relative mind. No doubt, with one voice, all governments, all religious leaders unanimously claim that peace on Earth and peaceful coexistence are their main aim. But nobody has any knowledge of peace or peaceful coexistence. He who does not know himself cannot have any peace, and he who does not have any peace cannot have any peaceful coexistence with others. That is a law of nature. You cannot understand anything without going beyond the body and mind. When you go beyond your body and thinking mind, then you will understand what is going on in your unconscious, subconscious, conscious and superconscious mind, because then you are their witness. The witness is always beyond time and space, while the doer is always within time and space. Everybody has his or her own universe. All want peace and peaceful coexistence on the level of the thinking mind, but that mind is the cause of all multiplicity, division and disunity. The witness is always beyond the body and mind. Be the witness. Feel: "I have a body and mind, but I am not the body and mind. I am not the emotions. I am That 'I-Am'. No doubt, I am experiencing from morning until evening more than a thousand individual 'I-ams' (personal thoughts and identities), but I am the witness of them, because I am always beyond time and space while they are movements within time and space." You cannot know what peace and peaceful coexistence are without meditating on Absolute Godhood in the form of "I-Am" beyond the body and mind. You are bliss. When you feel blissful and peaceful, then you have peaceful coexistence with all of nature, not only with this planet, but also with the sun, moon, planets and galaxies, with all of existence. The whole house of nature becomes your own home. Nobody can meditate on another person's God. But when you come into "I-Am" beyond the body and mind, beyond imagination, you cross the ocean of saňsāra, ignorance, and you feel your own Being. When you are operating beyond time and space as the witness, then you feel that the whole universe is interwoven within your mind, and you are always beyond the mind. Excerpted from the essay "The Universal Search for Peace," written in 1987 and published as part of the book by the same title. 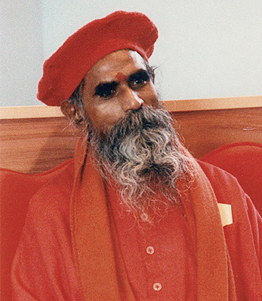 Copyright © September 11, 2002 by Baba Bhagavandas Publication Trust, Monroe, New York. Shri Brahmananda Sarasvati's writings are available either directly through the Publication Trust or the Ananda Ashram Gift Shop.